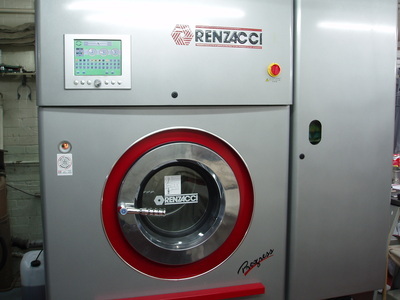 A dry-cleaning machine is similar to a combination of a domestic washing machine, and clothes dryer. Garments are placed into a washing/extraction chamber (referred to as the basket, or drum), which is the core of the machine. The washing chamber contains a horizontal, perforated drum that rotates within an outer shell. The shell holds the solvent while the rotating drum holds the garment load. The basket capacity is between about 10 and 40 kg (20 to 80 lb). During the wash cycle, the chamber is filled approximately one-third full of solvent and begins to rotate, agitating the clothing. The solvent temperature is maintained at 30 degrees Celsius (86 degrees Fahrenheit), as a higher temperature may damage it. During the wash cycle, the solvent in the chamber (commonly known as the 'cage') is passed through a filtration chamber and then fed back into the 'cage'. This is known as the cycle and is continued for the wash duration. The solvent is then removed and sent to a distillation unit comprising a boiler and condenser. The condensed solvent is fed into a separator unit where any remaining water is separated from the solvent and then fed into the 'clean solvent' tank. The ideal flow rate is one gallon of solvent per pound of garments (roughly 8 litres of solvent per kilogram of garments) per minute, depending on the size of the machine. Garments are also checked for foreign objects. Items such as plastic pens will dissolve in the solvent bath and may damage textiles beyond recovery. Some textile dyes are "loose" (red being the main culprit), and will shed dye during solvent immersion. These will not be included in a load along with lighter-color textiles to avoid color transfer. The solvent used must be distilled to remove impurities that may transfer to clothing. Garments are checked for dry-cleaning compatibility, including fasteners. Many decorative fasteners either are not dry cleaning solvent proof or will not withstand the mechanical action of cleaning. These will be removed and restitched after the cleaning, or protected with a small padded protector. Fragile items, such as feather bedspreads or tasseled rugs or hangings, may be enclosed in a loose mesh bag. The density of perchloroethylene is around 1.7 g/cm³ at room temperature (70% heavier than water), and the sheer weight of absorbed solvent may cause the textile to fail under normal force during the extraction cycle unless the mesh bag provides mechanical support. Many people believe that marks or stains can be removed by dry cleaning. Not every stain can be cleaned just by dry cleaning. Some need to be treated with spotting solvents; sometimes by steam jet or by soaking in special stain remover liquids before garments are washed or dry cleaned. Also, garments stored in soiled condition for a long time are difficult to bring back to their original color and texture. Natural fibers such as wool, cotton, and silk of lighter colors should not be left in dirty or soiled condition for long amounts of time as they absorb dirt in their texture and are unlikely to be restored to their original color and finish. A typical wash cycle lasts for 8–15 minutes depending on the type of garments and degree of soiling. During the first three minutes, solvent-soluble soils dissolve into the perchloroethylene and loose, insoluble soil comes off. It takes approximately ten to twelve minutes after the loose soil has come off to remove the ground-in insoluble soil from garments. Machines using hydrocarbon solvents require a wash cycle of at least 25 minutes because of the much slower rate of solvation of solvent-soluble soils. A dry-cleaning surfactant "soap" may also be added. At the end of the wash cycle, the machine starts a rinse cycle wherein the garment load is rinsed with fresh distilled solvent from the pure solvent tank. This pure solvent rinse prevents discoloration caused by soil particles being absorbed back onto the garment surface from the "dirty" working solvent. After the rinse cycle, the machine begins the extraction process, which recovers dry-cleaning solvent for reuse. Modern machines recover approximately 99.99% of the solvent employed. The extraction cycle begins by draining the solvent from the washing chamber and accelerating the basket to 350 to 450 rpm, causing much of the solvent to spin free of the fabric. Until this time the cleaning is done in normal temperature, the solvent is never heated in dry cleaning process. When no more solvent can be spun out, the machine starts the drying cycle. During the drying cycle, the garments are tumbled in a stream of warm air (60-63°C/140-145°F) that circulates through the basket, evaporating any traces of solvent left after the spin cycle. The air temperature is controlled to prevent heat damage to the garments. The exhausted warm air from the machine then passes through a chiller unit where solvent vapors are condensed and returned to the distilled solvent tank. 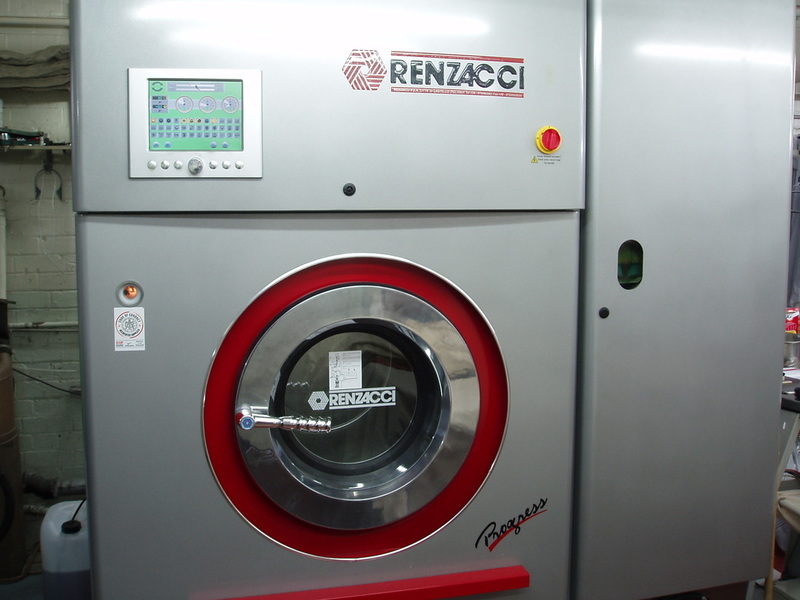 Modern dry cleaning machines use a closed-loop system in which the chilled air is reheated and recirculated. This results in high solvent recovery rates and reduced air pollution. In the early days of dry cleaning, large amounts of perchlorethylene were vented to the atmosphere because it was regarded as cheap and believed to be harmless. After the drying cycle is complete, a deodorizing (aeration) cycle cools the garments and removes the last traces of solvent, by circulating cool outside air over the garments and then through a vapor recovery filter made from activated carbon and polymer resins. After the aeration cycle, the garments are clean and ready for pressing/finishing.